(Introduction copied from DBPedia): Wikipedia is the by far largest available encyclopedia on the Web. Wikipedia has the problem that its search capabilities are limited to full-text search, which only allows very limited access to this valuable knowledge-base.Semantic Web technologies enable expressive queries against structured information on the Web. The Semantic Web has the problem that there is not much RDF data online yet and that up-to-date terms and ontologies are missing for many application domains. The DBPedia project approaches both problems by extracting structured information from Wikipedia and by making this information available on the Semantic Web. A major feature of DBPedia is to enable sophisticated queries against Wikipedia using SPARQL. Extracting structured information from Wikipedia leads to quite astonishing query answering possibilities. In February, the dbpedia dataset was available for download. For example, here are the N3 statements about Francis Crick that were extracted from wikipeda with dbpedia. <http://en.wikipedia.org/wiki/Francis_Crick>      <http://3ba.se/wikipedia/attributes/name> "Francis Crick" . <http://en.wikipedia.org/wiki/Francis_Crick>      <http://3ba.se/wikipedia/attributes/caption>      "Francis Harry Compton Crick" . <http://en.wikipedia.org/wiki/Francis_Crick>      <http://3ba.se/wikipedia/attributes/nationality>  "[[Image:Flag_of_the_United_Kingdom.svg|20px|]]  [[England|English]]" . <http://en.wikipedia.org/wiki/Francis_Crick>      <http://3ba.se/wikipedia/attributes/alma_mater>   "[[University College London]][[University of Cambridge]]" . <http://en.wikipedia.org/wiki/Francis_Crick>      <http://3ba.se/wikipedia/attributes/known_for>    "[[DNA|DNA structure]], [[consciousness]]" . <http://en.wikipedia.org/wiki/Francis_Crick>      <http://3ba.se/wikipedia/attributes/prizes>       "[[Image:Nobel.png|20px]] [[Nobel Prize for Physiology or Medicine|Nobel Prize]] (1962)" . <http://en.wikipedia.org/wiki/Francis_Crick>      <http://www.w3.org/1999/02/22-rdf-syntax-ns#label>        "Francis Crick" . The result is a java application called WikiStory. Selecting one or more category will select all the people that belong to it. 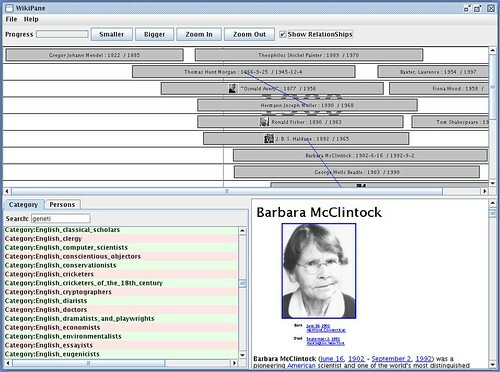 Clicking on a person in the timeline will load the page from wikipedia. Great collection of links, Pierre!